Automated mining but watch out for aliens! Celebrating the end of 2017! Since I'm not American it's always strange to see college life in another country. I'm in the UK and the system was different; maybe it's changed now? Heh, I remember how bad the food was, though there was one place I remember liking the milkshakes and toasted cheese sandwiches. When my character came out to his parents... wow, that was upsetting for me... I guess because mine took it so badly and our relationship changed afterwards. I've been trying to do a visual novel based on my own experience and even got as far as an artist doing my main character. Easier said than done! It was inspired by other card games like Hearthstone and Eternal, however, I realised writing an AI for a game like that would be difficult - also PvP would need networking, something I've never tried before. I lost the plot towards the end and gave up but will try again. Think of this as the third prototype (I restarted during the jam). This is unfinished. I ran out of ideas beyond the solitaire with rock-paper-scissors. Once you clear the pile, it adds more cards, but then... I couldn't think of and end game. BlastFX community · Replied to Ben Hickling in Error: Unable to open gradient preset directory! BlastFX community · Created a new topic Error: Unable to open gradient preset directory! I'm working on a hybrid card game - solitaire (patience for us brits) and rock, paper, scissors. Got most of the logic working now to add all the polish. That's my version. Wonder why I get "index out of bounds"? The audio broke up a little on my Windows 10 gaming laptop. I could hear crackling, like the sound wasn't playing right. A little more variation in the music would have been nice! Doesn't run in Firefox. "abort(113). Build with -s ASSERTIONS=1 for more info." Doesn't run in Firefox - index out of bounds. I've updated the windows ZIP file. I exported from a version of Godot that requires Mono to be installed. I didn't actually use Mono (C#) so I assumed it wouldn't need it. Oops! My other half has tried running it, the first version dies this version works. Aw nooooo... it works fine on two machines I've tried it on. I'll post a debug version maybe that will reveal some answers. Ah, I've not tested it on Mac! My laptop has a weird resolution of 1366 x 768; once I switched to that the flicker went away. I installed this on Linux Mint and it flickers every two or three seconds; didn't see this on the Windows version. Are you running the web browser version? There seem to be issues with HTML5 with some browsers - you get a blank screen. As soon as I get the Godot V3.0 version working I'll update this. WakiZoids is an asteroids style game. I entered an earlier version of it to Game Off 2017. You can see my entry here: https://imekon.itch.io/wakizoids. In this game you earn points by shooting rocks, fighting with aliens. To win, kill all the aliens. There are a LOT of them. This edition has a pet you need to rescue before aliens get to him, a christmas pudding and extended tracking - I've upgraded the ACME Tracking to short and long range sensors with filters. I'm planning on taking this game a lot further. I'm hoping to add planets, jump gates, hyperspace, trading, the kitchen sink and so on. I've been wanting to create some kind of game and this seems to be it! I used to work in the Games Industry. My name appears on a few racing games: DiRT, GRiD and F1 2011. Had me scratching my then... oh yeah! Someone had set gravity to zero, so it cause a divide by zero error. The cars on the racing ground were all imploding, and the one in the garage imploded, flew around the room and out the window! While I was doing WakiZoids, I set the black hole attraction force too high and reversed. I started the game and a whole bunch of game objects just shot past me. I've removed the HTML5 version of my game (https://imekon.itch.io/wakizoids) - it seems to hang in Firefox more often than not, and does the same in Chrome. I've also noticed when it does run, sound doesn't work properly - as I press 'thrust' (up arrow) you hear the sound. You keep the button down and it stops playing as it reaches the end of the sample! Doesn't do this in the windows version. Sound was breaking up for me. I know, I remember my first attempt... the table exploded!!! I noticed this too, but didn't think any more about it. 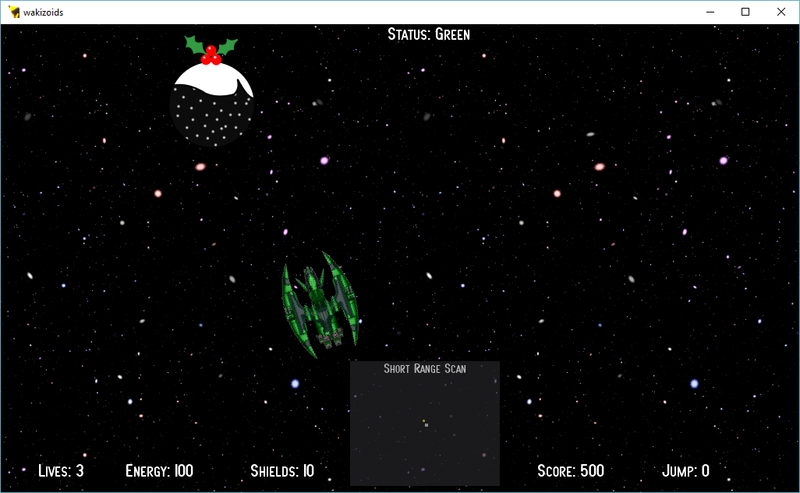 I can tweak the numbers until the aliens are in view and start shooting, and reduce the range of the bullets a bit more until asteroids are visible as well. I did think of adding a "tweak page" where users can set these numbers 'at their peril'. The aliens move rather fast sometimes! The ball got stuck on the right hand side of the screen! Game Off community · Replied to kyperbelt in Screenshots? I'm guessing I'd have to submit my game first? Game Off community · Created a new topic Screenshots? How do I submit screenshots here for a game in progress?